One of the biggest data breaches in history hit Under Armor owned MyFitnessPal. MyFitnessPal is a smartphone app that tracks users caloric and macro intake. It used to be a lone app, however, in 2015 it was purchased by Under Armor for $475million. The hackers came away with the usernames, email addresses, and passwords of 150million users. Fortunately, they were only able to access the passwords in hashed form. Therefore, it is unlikely they will be able to do anything with them. 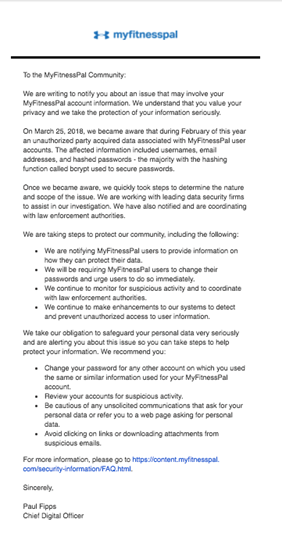 Nevertheless, MyFitnessPal notified all users of the beach and is requiring the affected accounts to alter their passwords. Matthew Green, a cryptographer at Johns Hopkins University believes the hack likely came from a transition between the secure bcrypt hashing system, and the more vulnerable SHA-1 hashing system. The difference between the two software’s primarily come from their hashing speed. Bcrypt takes a long time to hash, therefore using a lot of computing power to do so. While, SHA is a much faster hash, yet, not as effective. For a general rule of thumb, the slower the hashing process is the safer the encryption process will be. If you are worried your organization is not secure, feel free to reach out and see how we can help.